Water flossing is a great way to remove food particles between and around your teeth. I like water flossing better than traditional string flossing because it’s convenient and easy. Waterpik was the first water flosser I bought. Over the past years, I’ve tried to find better water flossers than Waterpik, but there are none. After buying so many flossers from different brands, Waterpik remains the best. 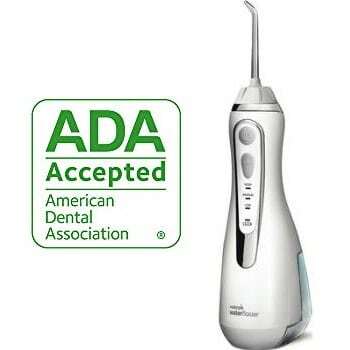 Waterpik Water Flosser is so good that it has the American Dental Association (ADA) Seal of Acceptance. What’s the ADA Seal of Acceptance? The program began back in 1931. Since then, dentists and consumers recognize it as the gold standard for evaluating the safety and effectiveness of dental products. If a dental product has the ADA Seal of Acceptance on it, it means that the product is the best. It means lots of dentists trust it. It means that it’s high-quality. And it also means that very few products can beat it. There are different models of water flossers from Waterpik. They all work well. They are all premium flossers. But one stood out to me. I consider it the best water flosser from Waterpik. It’s the Waterpik WP-560 Cordless Advanced Water Flosser. This article is a review of this water flosser. You’ll find out why it’s the best water flosser in the world right now. This Cordless Water Flosser comes with four tips. Other Waterpik models like WF-03 and WP-360 only come with three and two tips respectively. Why should you care about the number of tips you receive? The tips are what you use to floss the teeth. You need to connect the tip to the water flosser. There are different types of tips with different uses. Classic Jet Tip: Ideal for cleaning between the teeth and below the gum line. Orthodontic Tip: The best tip for cleaning with braces. Plaque Seeker Tip: Ideal for removing plaques in hard-to-reach areas. Toothbrush Tip: It looks similar to a toothbrush. It brushes your teeth as you floss. There are some other types of tips from Waterpik. The ones I mentioned above comes with the Waterpik WP-560 Water Flosser. You won’t be disappointed using any of these tips to floss your teeth. You can also buy more tips if you want. If you ask me, I’ll tell you that the premium tips that come with the water flosser are more than enough. I use these four tips to floss, and they do a great job giving me a high-quality water flossing experience. There’s no doubt that you’ll feel the same way after trying the water flosser. The orthodontic tip is one of the best tips I’ve seen for braces. It gets food debris out under the braces. You need a high-quality water flosser that comes with a great tip for braces. WP-560 is that water flosser. Whether or not you’re undergoing orthodontic treatment, the tips that come with this water flosser gets the job done. That’s why I highly recommend it. If you travel a lot like I do and want a water flosser that’s good for travelers, you’ll be making the right decision choosing this Waterpik flosser. The water flosser is portable, and it comes with a travel case. The case itself is made with high-quality materials that’ll make it last longer. For some water flossers I’ve bought in the past, their travel case quickly got spoilt, and I had to replace them. I’ve been using my WP-560 travel case for some years with no complains. It shows how good this flosser is. I believe that’s it’s very important to maintain a consistent oral care routine. Waterpik WP-560 Cordless Advanced Water Flosser allows me to do that. Whether you are home or away, you want to ensure that you’re still using the same toothbrush, water flosser, toothpaste, and mouthwash. 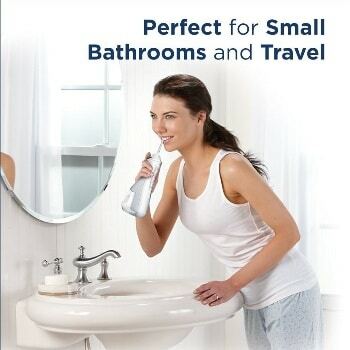 Waterpik WP-560 is that water flosser to take along with you. The last thing most people think about when traveling is their oral care products. First, you think about your clothes, shoes, wristwatches, and maybe some books. I’ve been guilty of forgetting my toothbrush, water flosser and toothpaste many times when traveling. 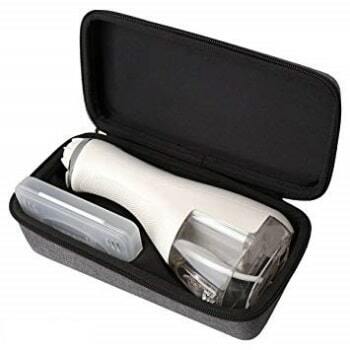 But since I got WP-560, I no longer forget my water flosser because it comes with a travel case. The travel case allows me to put the flosser into my travel bag without breaking it. A high-quality water flosser should come with a travel case I can use while traveling. The flosser doesn’t have much weight. It’s very portable and easy to carry around. 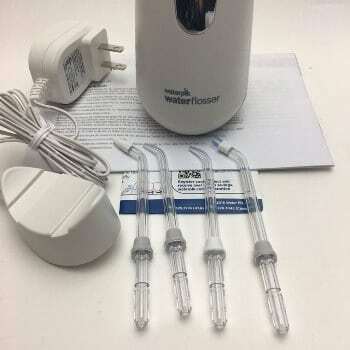 Waterpik WP-560 water flosser comes with a magnetic charger. It only requires 4-hour magnetic charging for the flosser to be fully charged. Magnetic charging is the future. For this water flosser to come with a magnetic charging shows the extent of Waterpik innovation prowess. CB Insights shows that Waterpik has filed 159 patents in oral care alone. Waterpik is at the forefront of innovation in the oral care space. The company recently filed a patent for handheld oral irrigator (water flosser). That’s why I’m not surprised that they are the first oral care brand to adopt magnetic charging. Although there’s no charging difference in speed for both magnetic and cable charging, most people agree that magnetic charging seems a little bit more comfortable. You don’t have to plug cables everywhere. Cables are becoming a thing of the past. Most products are now going wireless for everything. And I like the fact that I can start getting that experience from my water flosser. Just put your water flosser somewhere and charge it magnetically. You don’t have to connect cables to the socket. This is a nicer experience for me when traveling and when I’m home too. People who have kids who play with cables say that this is better for them. Since they can charge without their playful kids noticing it. We have seen magnetic charging for our smartphones, toothbrushes and a lot of other products. Water flossers should be part of the change too. The demand for wireless charging products is increasing across the board. There’re zero wears on the charging cable because there’s no cable. If you want an innovative water flosser, Waterpik WP-560 is without a doubt, the flosser to buy. The flosser gives you everything you want from a perfect water flosser. And magnetic charging is just one of those things. Waterpik WP-560 Water Flosser is so easy to use. Even if you hadn’t tried using a water flosser before, you wouldn’t have any problems the first time you use this flosser. Some people don’t buy water flossers because they think that it may not be convenient for them. So, they continue doing traditional flossing, which takes a lot of time and effort. After trying this water flosser, you’ll never want to do traditional flossing again. A friend’s mom once told me that she doesn’t like water flossers because they don’t remove any food debris. That was her believe until one day she decided to try Waterpik WP-560 Cordless Advanced Water Flosser, she was completely surprised by the experience and results she had with it. Today, she doesn’t do traditional flossing again. If you have doubts about the flosser, I’m 100% sure that those doubts will be gone the first time you try it. The flosser isn’t only easy to use, it also does a better job than most options available out there today. Filling the reservoir of the water flosser is easy. It’s easy to connect the tip all by yourself without requiring anyone’s help. It’s also easy to use it by pointing the tip to your gumline and floss. If you have sensitive teeth, dentists recommend that you fill the reservoir with warm water and maybe some mouthwash. Waterpik WP-560 Cordless Advanced Water Flosser has high-number of reviews from customers. Currently, there are about 1,300 customer reviews for the product. Lots of these reviews are positive views from customers who have bought the product. It shows that a lot of people are interested in this water flosser. It’s easy to use. It massages your gums well. And it takes out food debris that is stuck between your teeth and gums. Waterpik is one of the first water flossers to add 360-degree tip rotation to its water flosser. The feature helps you reach every hard-to-reach area on the teeth and gums. Many water flossers lack this feature, and that’s why Waterpik beats them in terms of the quality of the flossing experience you’ll get. It’s true that some water flossers don’t remove all the food particles on the teeth and gums. They leave some take out some. That’s not what you want from your water flosser. A good flosser should be able to remove every food particle that’s stuck between your teeth. Most water flossers don’t do that. Not with this water flosser. It’s no surprise why the Waterpik brand is the number one water flosser manufacturer in the world right now. For many years, Waterpik products have been the best. Their competitors have only been trying to catch up with them. The 360-degree tip rotation feature makes this flosser even more interesting. As you floss with it, the tip turns around to give you the perfect floss. Even if you’ve missed a food particle, the water flosser ensures that it removes it after you’ve left there. So, you’re unlikely to make errors with it. The 360-degree tip rotation feature corrects mistakes. Despite introducing the rotation feature, the water flosser is still easy to hold as you floss. It’s lightweight. Each of the four tips that come with the flosser works well with the rotation feature. You can rotate each of them while you floss. Whether you’re wearing braces, or just getting a regular floss, the 360-degree tip rotation feature will help you get a better flossing experience. The water pressure setting lets you control the force of the water spray produced by the water flosser. A good water flosser enables you to control the water pressure. Most countertop water flossers offer 3 – 10 water pressure settings. But you they aren’t portable. You can’t move them around. 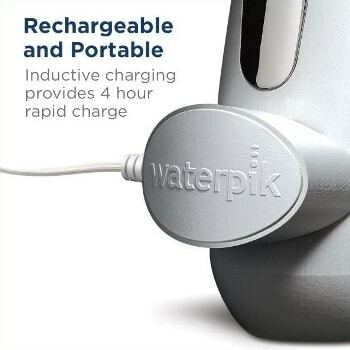 Waterpik WP-560 is portable. That means you can use it when traveling. It comes with three water pressure settings which are great for your flossing needs. Other portable water flossers from Waterpik only has 1 – 2 water pressure settings. I’ll say that WP-560 Cordless Water Flosser is the best portable flosser from the Waterpik brand. The flosser is also one of the best in the world. It gives you everything you need from a portable water flosser. 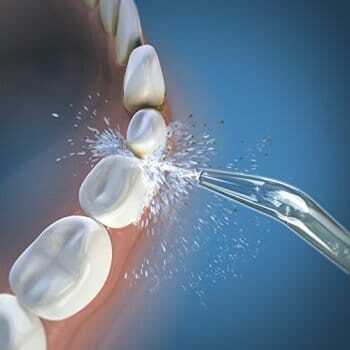 If you’re using the flosser for the first time, I advise that you start from the lowest pressure and increase it. The highest water pressure may be too much for your gums if you’re using the flosser for the first time. For example, people who have sensitive teeth and gums can’t use the highest pressure. It would be too uncomfortable for them. That’s why I always recommend that new users start with the lowest pressure. The amazing thing about WP-560 water flosser is that you can increase the water pressure while it’s working in your mouth. Just press the right button, and the pressure will increase. Make sure your mouth remains closed as you increase the water pressure. If your mouth isn’t, the water could splash out everywhere on the walls. Now, let’s talk about my personal impression of this water flosser. What do I think about it? First, I’ll like to say that I’m a proud owner of WP-560. I’ve been using Waterpik for about ten years, and their water flosser has never disappointed me. I’ve never had any major issue with their products. I’ve bought different water flosser models from Waterpik because I felt like changing my water flosser to a newer one. Not necessarily because the water flosser I was using had a fault. Waterpik WP-560 has a reservoir that can last 45 seconds. I believe that’s enough time to floss your teeth well. The recommended time for brushing your teeth is 2 minutes. And the flossing time is less than a minute. You shouldn’t be spending more than 3 minutes taking care of your teeth. Although flossing once a day is great, I usually floss my teeth twice a day. I hate anything getting stuck between my teeth. This water flosser is great for once or twice a day flossing, depending on what you want. It’s portable, and you can get a quick floss with it. Most dentists in the United States recommend it for patients undergoing orthodontic treatments, and those who tend to travel a lot. It’s portable and ensures that you don’t miss a single floss. Whether you are wearing braces or not. Or, you travel a lot or not. The water flosser is the right product for you. It’s the best portable water flosser in the world today. You can put mouthwash inside the reservoir when you’re about to floss. Instead of flossing and using your mouthwash separately, you can do both at the same time. Pour a small quantity of the mouthwash and add water to the reservoir. It’s so much easy to do that with a portable flosser like WP-560 than countertop water flossers. You can share the flosser with your partner and kids if you want. You’ll only have to use different tips. One tip for one individual. Waterpik sells more tips if you want to buy tips later after getting the water flosser. This water flosser itself comes with four tips that should be enough for a small family. This Waterpik WP-560 Cordless Advanced Water Flosser review covers every aspect of the flosser. It was made with portability in mind. Waterpik wants users to be able to carry the flosser around without problems. Some dentists refer to it as the best water flosser for travelers because it’s so travel-friendly than other flossers out there. Whether you travel or not, if you want a water flosser that’s portable and works well, I recommend you buy Waterpik WP-560. Don’t hesitate to buy it today.